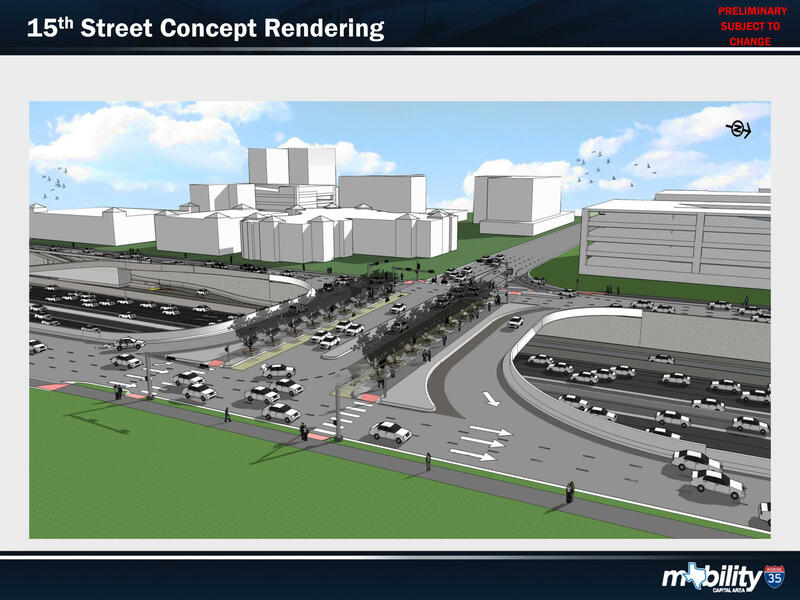 A rendering of the city's plan for I-35 at 15th St.
Plans for the decks on I-35. 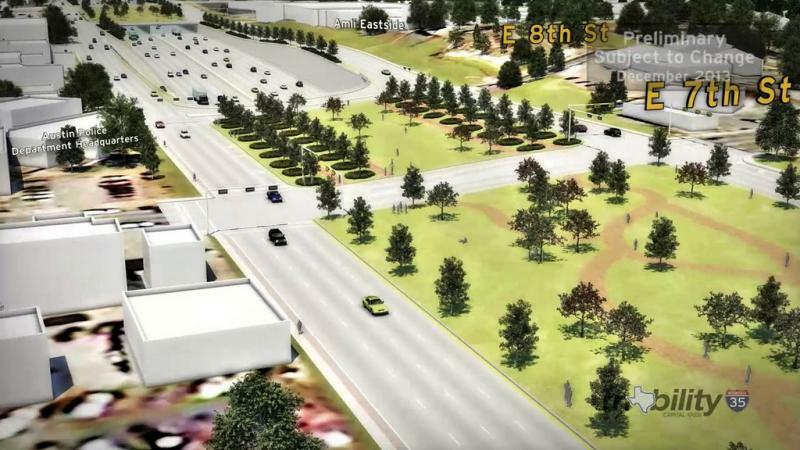 A new plan to improve Interstate 35 would add an additional lane on the upper decks of the highway between 15th and 51st Streets in Austin, according to a modified proposal announced today by state and city lawmakers. 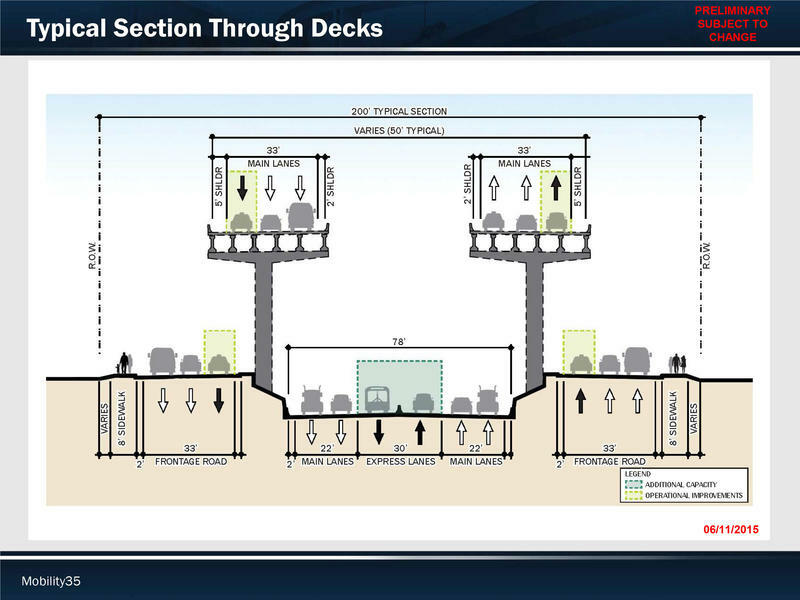 "The auxiliary lanes will give you a mile and a half to move into the main lanes of the upper deck and move those exiting to Airport [Blvd.] out of the main lanes," says Senator Kirk Watson, who laid out the new plan at a luncheon on Monday. I-35 in central Texas is one of the most congested highways in the state, with more than 200,000 vehicles a day in some sections, according to Mobility35. The new plan would also lower I-35 between Cesar Chavez Street to north of 12th Street, but that section wouldn’t be covered. Some local groups wanted to cap the highway to create parkland. Austin Mayor Steve Adler says the highway would be built so the city could cover it— or cap it — later. But he says any money to do that has to come from the city. “Because the caps don’t add to mobility, the community is going to have to rally to make that part of the project work,” Adler says. The Mobility35 plan includes dozens of standalone projects in Hays, Travis and Williamson counties. Watson says each part of the project is important. “Think of it as a series of pearls that by themselves each is valuable, but we want to string them all together," he says. But it could be a decade before the projects are completed, and not all of them have funding yet. Right now, the entire bill is $4.3 billion. Voters already approved a proposition that put $1.2 billion toward roads last year. And this fall, another proposition heads to voters. This one would direct $2.5 billion in vehicle sales tax revenue to the state beginning in 2017. 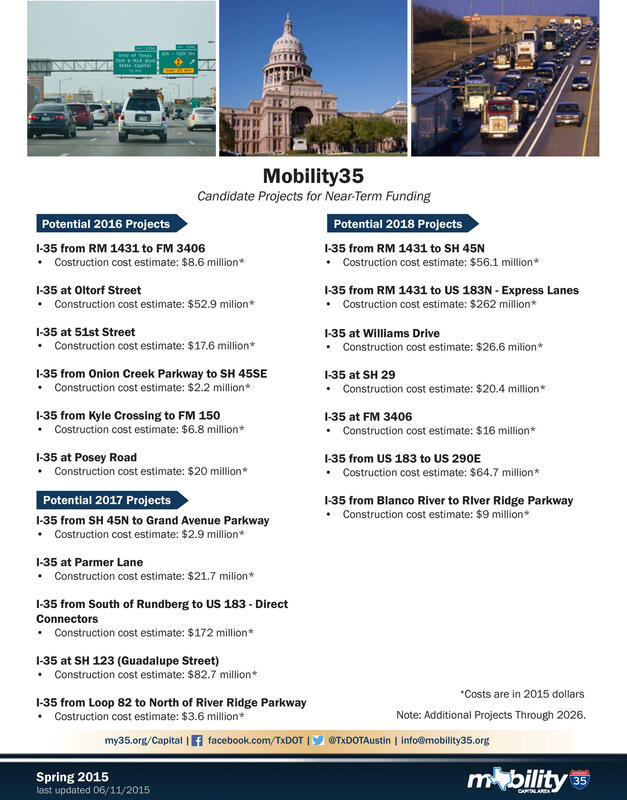 A planning timeline for proposed Mobility35 projects. KUT and our city hall reporting partner the Austin Monitor are looking at needs that have typically been paid for by the state, but have become local responsibilities. Some call them unfunded mandates. KUT News and the Austin Monitor will look at key examples of that interaction in our series, “The Buck Starts Here.” Today, we take on Austin’s highways. You can read Tyler Whitson's companion piece over at the Austin Monitor. We hear it all the time: Austin’s growing too fast, and we don’t have enough housing or roads for the people already here, not to mention the million more people that will be in the region in a little over a decade. To better accommodate an influx of people and cars, new additions are being planned for several of the region’s major highways. But there’s no such thing as a free ride on most of these new lanes, and to understand why, it helps to do a little time traveling. 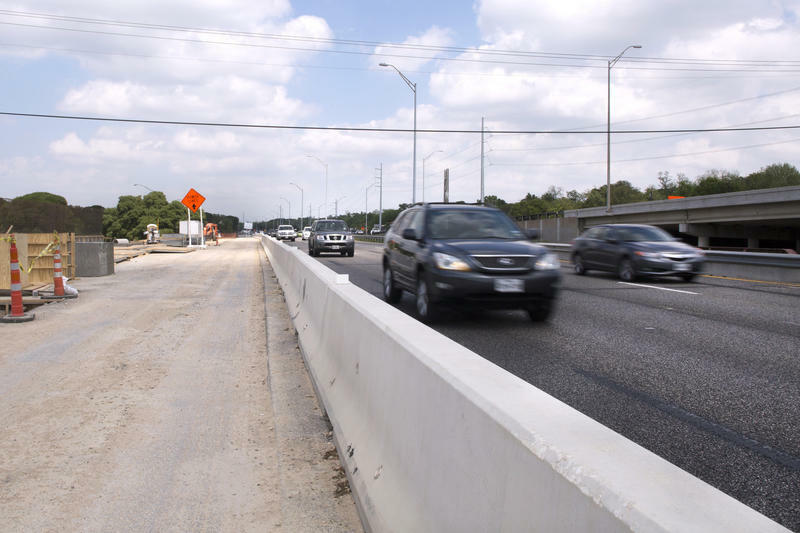 Sorry, Austin – there's no money to improve the Interstate 35 corridor. At least not enough for a full face-lift, according to the Texas Department of Transportation. But as money becomes available, TxDOT says it will continue working on portions of the highway. At a media workshop today, the state agency said that by the end of the year it should move from the planning stages of I-35 improvements and into studying their environmental impact. That should take about two years. And then – if funding is available – it will be time to start implementing changes.